By using AWS for our new IoT platform, we saved 80 percent in development cost. It also enables developers to focus on writing business logic for LG service scenarios. In December 2017, LG Electronics (LG) announced the launch of its LG ThinQ (ThinQ) brand to categorize all its upcoming smart products and services, which feature artificial intelligence (AI) technology. The concept of ThinQ is to embed Wi-Fi chips in LG products, which allows these products to communicate with each other while learning about their user’s behavioral patterns and environments. To date, LG has sold more than 70 million smart TVs and five million home appliances around the globe. As the sale of its Wi-Fi-enabled products increased, the activation rate for LG’s smart appliances increased concurrently, which led to a burden on its servers on premises. This growth called for a new platform that could accommodate an increasing number of smart devices connected to LG servers. As such, LG built an Internet of Things (IoT) platform for ThinQ appliances, but experienced difficulties in securing resources for server development and operations. In LG’s search to ensure reliable device connectivity, the company constantly reviewed new technologies that were compatible with its existing services aside from ThinQ. LG looked to migrate its IoT platform to a new infrastructure that was easy to manage, secure, and cost-effective. In 2016, LG successfully migrated its IT platform for home appliances, including more than 1,000 servers, from its data center to Amazon Web Services (AWS). 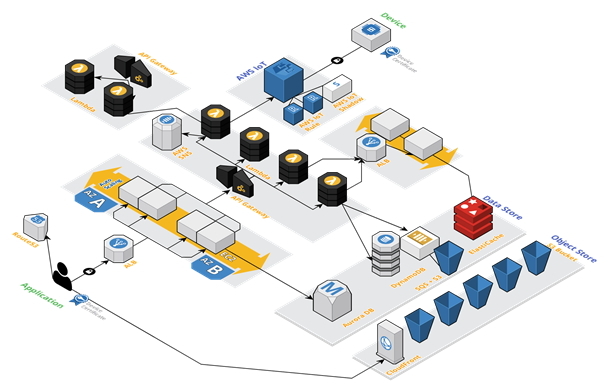 The business adopted Amazon Elastic Compute Cloud (Amazon EC2) and Amazon Simple Storage Service(Amazon S3). In 2017, LG learned about AWS IoT and its serverless architecture. LG decided to use AWS IoT based on an understanding that this would reduce management time for its IoT platform. In addition, AWS was the only cloud provider whose IoT services could meet LG’s requirements to support the ThinQ platform. The company then began using AWS IoT Core to maintain continuous connectivity between ThinQ devices and its IoT platform. LG also started using AWS Lambda (Lambda) for serverless computing that registers ThinQ devices on the cloud, stores device data, and controls device status information. For authentication between ThinQ devices and its IoT platform’s servers, LG uses X.509 certificates. The ThinQ platform also stores data in Amazon ElastiCache and Amazon DynamoDB, which provide historical data for services. “With the previous infrastructure, we retrieved data directly from devices to get status information. Now, the Device Shadow Service feature for AWS IoT enables the system to cache the status information from the server. This feature has made it possible to deliver better service consistency,” says Kunwoo Kim, chief of the Service Development Team at the LG Cloud Center. Because of the managed services and AWS IoT Core, LG was able to relaunch its IoT platform with a modest number of development resources. “By using AWS for our IoT platform, we saved 80 percent in development cost. It also enabled developers to focus on writing business logic for LG service scenarios,” says Mr. Kim. “Our infrastructure team and development team operated separately, resulting in miscommunication and inefficiencies when it came to infrastructure allocation. With AWS, developers can improve efficiency by building the infrastructure themselves and then consulting with our infrastructure team when development work is almost complete,” says Mr. Kim. LG is also using AWS IoT and a serverless architecture for air-quality monitoring services, customer service chatbots, and energy solutions. Since March 2018, a chatbot service for customer support that was developed using serverless services has been running in Korea and the United States. The business is working with AWS solutions architects to resolve issues with its cloud infrastructure. "We found that it was better to receive help from AWS solutions architects compared to solving problems ourselves. AWS is a great solution for customers because AWS enables developers to focus on their core tasks, like writing business logic and running test environments. We have plans to continue using AWS services for other projects in the future,” says Mr. Kim.